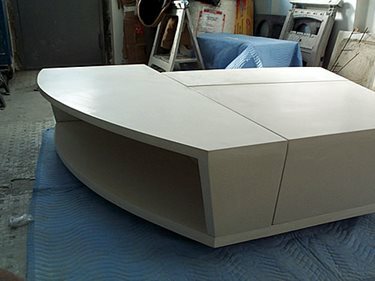 Eric Weil, sculptor and founder of Oso Industries, sent in photos of a custom concrete coffee table he recently created. Weils design studio focuses on new applications of concrete for furniture using designs inspired by urban living. 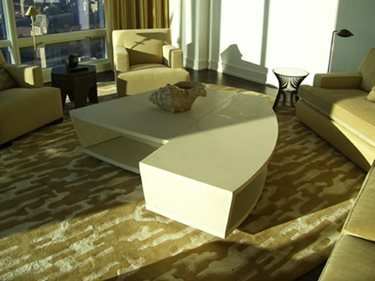 This concrete coffee table was created for the owner of a penthouse in Manhattan. The client's designer approached Weil with sketches for the table. Weil, who individually hand crafts multifunctional furniture made of concrete, went to work figuring out the technical way to accomplish the task. The table was made up of four concrete sections. The base, the largest of the sections weighs 250lbs. The entire table weighs about 800-900lbs. 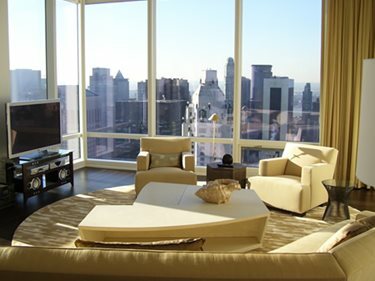 Because it was designed in sections, Weil and his crew were able to transport it via the elevator to the penthouse. The table is approximately 5-foot square and 16-inches tall. Each piece pushes up against the other for a seamless look with no brackets or hardware. To build the table, Weil designed a one-time use mold in which he cast the table upside-down. The mold had to be destroyed to remove the finished pieces. 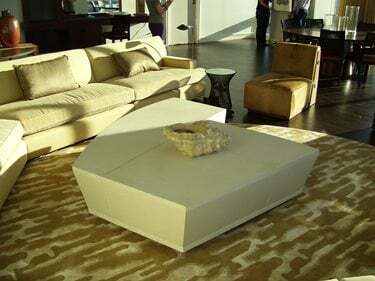 Weil cast the flat base of the table as a stepped platform so the table appears to be floating. Weil says, "The support is tucked in, recessed two-inches in, so the underneath is completely solid." Because the table has open areas in the middle Weil had to handform the concrete in the mold. Because of the open areas, the concrete had to be laid up the sides of the mold by hand because the walls of the table taper inward, so it was difficult to get the concrete to stay. "The trickiest part," recalls Weil, "was that one section is 5-foot long and open on the long sides. At the widest part of the table, there is a two-foot overhang. I had to get the top to support itself at 1-inch thick." To do this, Weil placed chopped fiberglass into the wet concrete mix, and then embedded welded wire mesh. The top of the table features a smooth finish that requires one of Weils special techniques. "I applied the concrete in thin layers to build it up," he says. "This allows me to create a smooth, creamy coat for the top so no aggregate shows through." To achieve the desired color, Weil used titanium white pigment with white cement. "Original white cement dries with a tannish color," says Weil. "To make sure it stayed white, I used the pigment. It brightens the white cement." To complete the look, a clear coat of sealer was applied on top.